Vinny Marotta bought five acres of land in Thorndike a few years ago hoping to build a small house without going into debt. He cleared a patch of forest, landscaped a portion of it and as he had money he built a 10-by-10 foot building, often using repurposed materials. 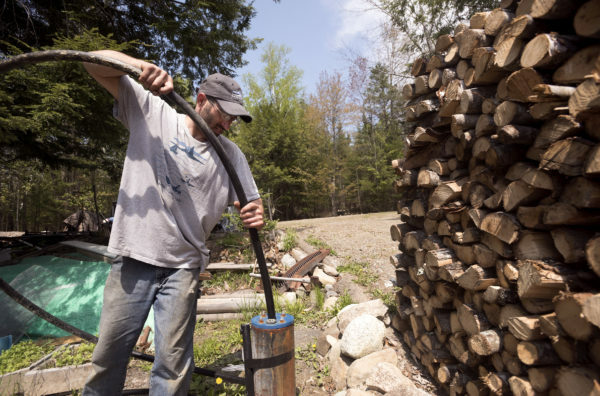 Vinny Marotta works on installing a temporary pump in the well at his Thorndike property. Marotta bought five acres of land in Thorndike a few years ago hoping to build a small house without going into debt. He cleared a patch of forest, landscaped a portion of it and as he had money he built a 10-by-10 foot building, often using repurposed materials. Vinny Marotta bought five acres in Thorndike a few years ago hoping to build a small house without going into debt. "It was all forest when I started," he said. Vinny Marotta bought five acres in Thorndike a few years ago hoping to build a small house without going into debt. "It was all forest when I started." He built a 10-by-10-foot building, often using repurposed materials. Vinny Marotta bought five acres of land in Thorndike a few years ago hoping to build a small house without going into debt. "It was all forest when I started." 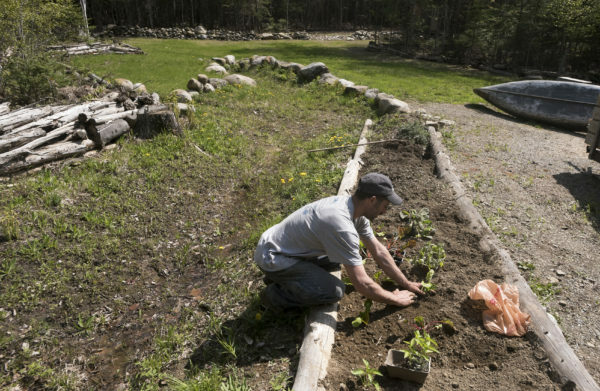 Vinny Marotta, 35, plats seedlings in the garden at his Thorndike property. Marotta bought five acres of land a few years ago hoping to build a small house without going into debt. He cleared a patch of forest, landscaped portion of it and as he had money he built a 10 by 10 foot building, often using repurposed materials. Marotta continues to work on his property making improvements as he is able to afford it. 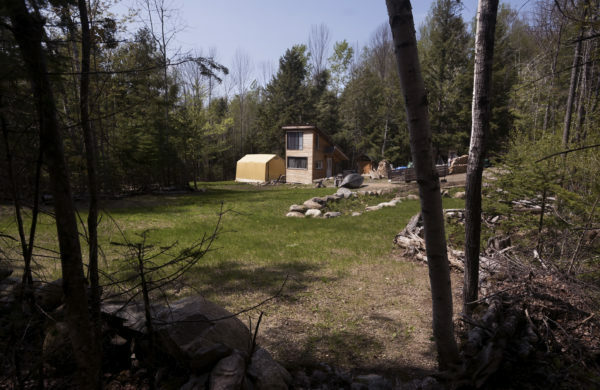 In a small clearing off a sleepy dirt road in Thorndike, something surprising is tucked behind a screen of trees: an emerald-green lawn with a handmade tiny house sitting on it that juts up to the sky. The house, the lawn and the other myriad homesteading projects happening in the clearing are the product of one man’s imagination, rabid work ethic and ability to make something cool out of mostly reclaimed and recycled materials. Vinny Marotta took advantage of a recent sunny, 80 degree day to work on his raised bed garden and on the installation of a temporary pump for his well. Despite the heat, the sweat trickling down his face and the swarming blackflies, it was apparent Marotta was exactly where he wanted to be. His life wasn’t always this way. Marotta, 35, grew up in suburban New Jersey but never quite fit in there. He didn’t really want to go to college, either, but he found out about Unity College and got interested, though not necessarily because of academics. Instead, it was Maine’s rivers and lakes he liked because he was “really into fishing.” Marotta came to Maine to check it out and has called the Pine Tree State home ever since. “I took to it pretty quick,” he said. At Unity, he studied park management and environmental studies and after graduating scored a seasonal job working for the Maine Island Trail Association. He has worked as the summer caretaker on Jewell Island in Casco Bay ever since. He loves his job, but for years longed to have a fixed place to go when he wasn’t on the island. In 2013, he had saved up some money and was looking around for land to buy. 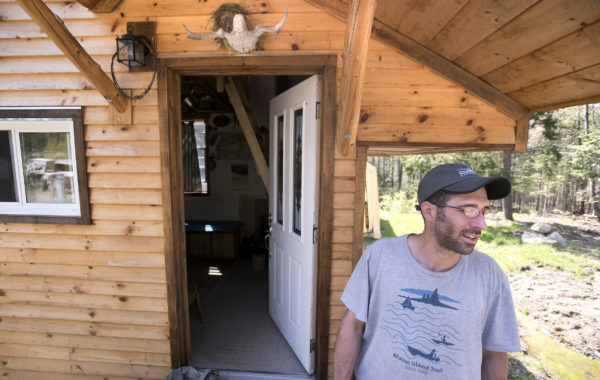 He found a 5-acre parcel in Thorndike that was affordable and started spending evenings on the island sketching the home he wanted to build there. 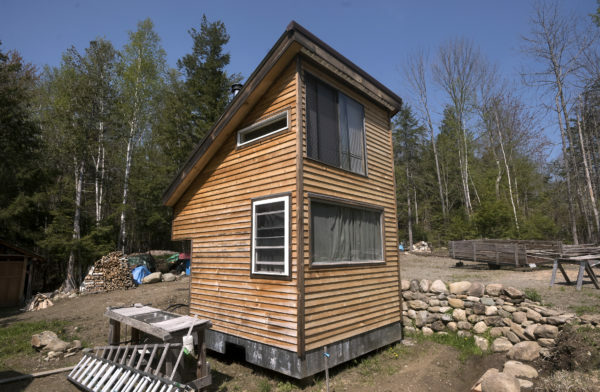 Marotta, who also is a carpenter, wanted to keep the house on a 10-by-10 foot footprint so he could avoid the hassle of getting a building permit. “I just wanted a shack with a stove,” he said. But even though he wanted something simple, he wanted to do it right — and didn’t want to borrow money to make it happen. Instead of paying a monthly mortgage to the bank, Marotta has paid for it in time and sweat equity. “The years are just flying by, and I’m not too far along yet,” he said, ruefully. But that’s not entirely true. The four years since he bought the land have also brought a lot of changes, to his homestead and to his life. There’s a fancy outhouse and a plan to have reliable running water and an outdoor bathing facility on the property. Early on, Marotta used his trusty Jeep to log out his clearing, reducing it to stumps and boulders, and then had that cleared out and turned into lawn. He also built that 10-by-10 structure, but it is more substantial than a mere shack. 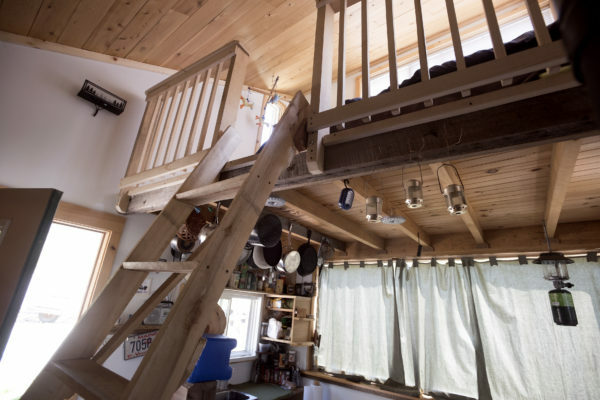 He sleeps in an upstairs loft that’s accessed by a ladder, which is not atypical of tiny houses. 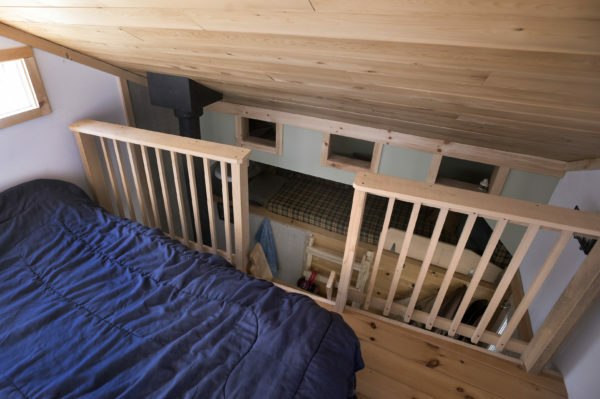 But in place of the classic badly lit and claustrophobic sleeping area with a ceiling so low you could bump your head if you sit up suddenly, he built a full — if steeply pitched — second story with large windows that allow lots of light to come in. The downstairs is taken up by a simple kitchen area, benches for seating and a small but efficient wood stove in one corner. There are also some children’s books and toys, clues to another important recent change in Marotta’s life: the birth of his daughter, Rhea Marotta, who now is 15 months old. Back in 2013, at the same time he was thinking seriously of buying land and building a home, he met the woman who would become his partner when she camped on Jewell Island. Kelsy Ross, the head coach of the Bates College soccer team, has a life that is based in Lewiston, so that is where Marotta spends most of his off-island time. But she supports his goal to build the homestead in Thorndike. Right now, it’s hard to have an active, busy baby on the property. The house is too small for her to crawl around and the bugs can be ferocious. But that’s part of why Marotta is working so hard. One day, he would like to turn his talent and time toward building a larger house on the land — a two-story home with about 1,280 square feet of living space. Although that would dwarf his tiny house, it still would be much smaller than the average new American home, which has more than 2,600 square feet. It would also allow the three of them to be comfortable there together, and that drives Marotta forward. “That’s what keeps me motivated,” he said of his family. And that’s why those hot, hardworking days are so satisfying to him.